Stylish and fun, this Anchor Hocking Oneida 98908 5 oz. mini Heremes jar is perfect for your front of house displays. Use it to hold candy, coffee beans, espresso beans, and other goodies. Or, use it back in your kitchen to store ingredients, such as salt, sugar, or spices. Whether you're using it for retail, storage, or to create eye-catching displays, this Heremes jar is sure to fit your needs. The crystal clear glass allows customers to see exactly what's in the jar, and the air tight, clamp top lid will help to keep food tasty and fresh. Purchased these in an ongoing effort to minimize plastics and waste in my home. The idea is that I can now purchase bulk herbs and spices and avoid the packaging. These jars are amazing! They’re heavy and air tight with the Hermès clamp. And they are stunning to boot! Filled with the rainbow of spices and labeled and organized so neatly...well, that is just plain joy inducing! We put granola in these for a takeway gift at our fine dining restaurant. Webstraunt store offers the best value. Mini Heremes Jar is a life saver. These jars are fabulous. They look great and are functional as storage. I keep my spices in here that I use often. I really recommend these. 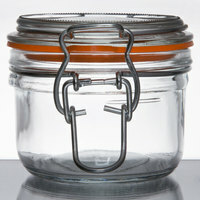 Very much like their European counterparts, these Heremes glass jars are great for...well anything you can think of. We use these for delicate spices and keep them on display in our home kitchen. They form an airtight seal and are very durable. The nice thing about these Anchor Hocking Heremes glass jars is that they are readily available in the USA, while the original French ones are very difficult to buy at a reasonable price here in the states. These 5oz glass jars are of surprisingly good quality! We use them to store and display loose tea in our store, and will continue to order them! These itty bitty jars are the absolute cutest things ever. They're going to be my herb and spice jars, but I'm thinking they'd be great for infusing oils, too. And the price is UNBEATABLE. Great little jars that look cute and fit the decor of our business. This product can be used for a lot of different things and we are pleased with the purchase. These are nice, not perfect but definitely nice enough for an upscale to go style dessert or promotional item. The seals are not tight enough to truly store anything long term, but have been great for our to go puddings and pot de cremes. They are oven safe (so far as we can tell - but we take the lids off before putting them in the oven. The Anchor Hocking five ounce mini hermes jar is a great storage solution for our herbs. Helps keep them fresh and well made and perfect design. These small jars are perfect for storing spices in a neat, organized way - the only problem is that if you have a great bulk spice source, a full package won't fit in them. Ideally you can line these upor stack them in your cabinet for use while storing the excess elsewhere, and then refill them as needed. These jars seal the freshness into spices so well, it's shocking! I like to make sure that I have plenty on hand for new spices and teas. We use these to hold lemons and limes and they work great. They keep the product fresh and crisp and they also look great on the bar. We use these to make our own spice blends to give as Christmas presents. We always get compliments on them. Great size and even greater price! these jars are absolutely the best. I put all my spices in these jars and the stack nicely and are heavy duty and seal wonderfully. I use this to store spices, and they have a year long shelf life in this container. Very good seal, but it can be challenging to get it open and closed quickly. I love love love these cute little jars. I use them for edible lip and hand scrub and they just couldn't be more adorable! They latch super tight so my product doesn't dry out. Thank you for your review, Mike! We are sorry you received a broken heremes jar. A Customer Solutions Representative has issued you a store credit! I've been looking for small jars like this for months and these fit the bill. I do small tasting portions of appetizers and desserts in them and they're great. Other jars are either tapered which I'm not a fan of or they're super expensive per jar and these by the case are a great deal. Removing the gasket makes them way easier to close if you don't need an airtight seal. We love these! They are perfect for storing all kinds of things. We use them in our lab for mixing oils and storing raw ingredients. I also love to use them in the kitchen. These glass jars seem to have a few quality control issues. A few of the jars I received have chips along the inner edge, which are jagged, sharp, and dangerous. Another jar I received was cracked on the side. The jars themselves are a nice size for herbs, spices, and small gifts, but I recommend thoroughly examining each jar for defects before use. Thank you for the review! We're sorry some of these were defective. A Customer Solutions Representative will contact you soon. Fantastic little glass jars. We use them for loose leaf teas at our coffee shop. Customers love them. Easy to maintain and seals the teas perfectly. Solid jars. These 5 oz jars are a must have, especially for the price! I use these for spices and chemical leaveners. Also use to store egg whites when splitting eggs. The seal is tight and keeps everything fresh! I am really liking this spice jars. The lids are tight fitting, easy to open and close. It keeps my spices fresh for a longer time. The price is good too. Shipping was fast! Product was just what I needed! For a small business owner the price was within budget. The appearance of the jars are eye catching! Website was awesome, easy to use, description were understandable, I could go on and on! You do have a repeat customer! I was very disappointed. The jars were exactly what I ordered and I was very excited until I notice many of the jars were broken or if you rub around the rim of the jar they were chipped, which is very dangers. I cut my finger trying to clean out the jar and distinguish which were ok to use and which ones were not. Thank you for the review, Toni! We are very sorry that some of these have chipped for you. A Customer Solutions Representative will contact you directly. I love these jars for many of my personal care products that I make at home. The seal and closure keep things fresh and the glass makes it easy to use with essential oils when plastic can not be used. The price on these is a plus! Good quality, open/close latch is easy to maneuver. I plan to use these for homemade bath products. I could also see them being used for canning jam or other delicious treats. However you use them, the presentation will be beautiful. Great price and come in sets of 12. Really good seal, glass is nice, will hold up for awhile. Good for keeping spice mixes or teas in. Good product. I love these little jars we use them in our desserts and also on our charcuterie boards, not to mention they make beautiful and practical spice jars for your home or business. very well made. I really really like these jars. My gf got me some great spices from Egypt but they were leaking their scent everywhere so I got these jars to hold them. I can't smell the spices at all from these jars which means that it's a good seal. The seal mechanism is a little rustic but it works. I'm considering trying to cook creme brulee in these using my sous vide. These are just the greatest jars for storing spices and herbs in my cabinet. I'm thrilled with the way the look and the quantity they hold. Easy to use, great to keep spices and herbs fresh and very attractive. You can't go wrong with these adorable, little jars. These jars are a great buy. Very sturdy at a great price, Feels like a steal of a deal. Researched many jars, ball, weck, etc. Really am impressed with the quality. Used to store spices as well as craft items like buttons. These jars are exactly what I wanted. I am disappointed though, it says in the description that they're made in the USA, but the box says they're made in China. Thank you for your review and for pointing out that error! We greatly appreciate your feedback! This issue has been fixed. We use these for storing spice mixes. This size is nice for gifts or selling. The seal is nice, and the bail is easy to work. Great items. They give Parfait, Kilner, and Weck a run for their money in quality. On point. Great for spices. Avoid bpas both in the jar and the lid, and have a Gordon Ramsey Home-esq look to your pantry.